Hello thare Monday! Today’s meat and potatoes is brought to you by the Irish! Easy, real food, homemade, comforting stew. Truth? I feel so sleepy right now. Like, jet lagged or somethin’. WELP! I can’t even remember how I got through getting the little ones ready for school this morning… I was half-asleep. Have you ever had a Dublin Coddle? I have a very off-the-boat Irish uncle and you better believe that this amazing stew happens often, but it doesn’t happen often enough. 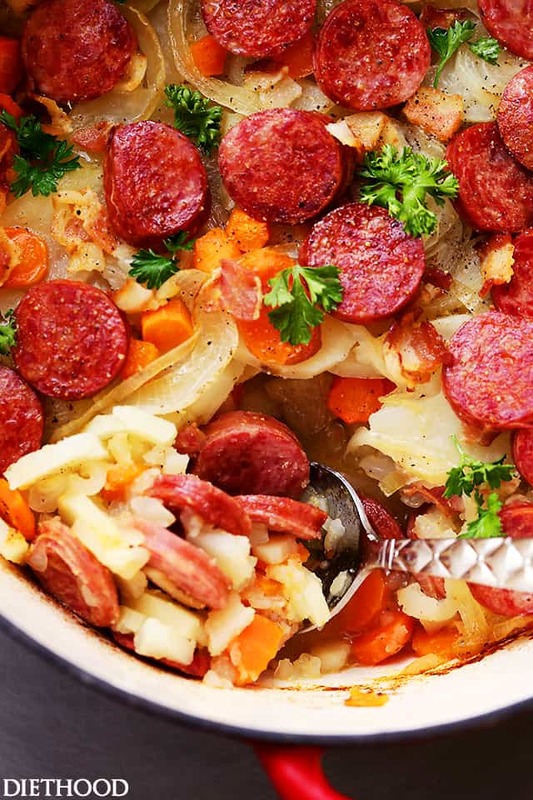 A mess that starts with sausages and bacon, and ends with flavorful and soft layered potatoes… GIMME!! 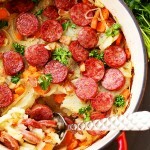 Maybe it’s too obvious, but I SO love layered casseroles, all in one pot, and in the oven. All the work I have to do takes up just a cutting board and a knife. The rest is done by our bestie, the oven. 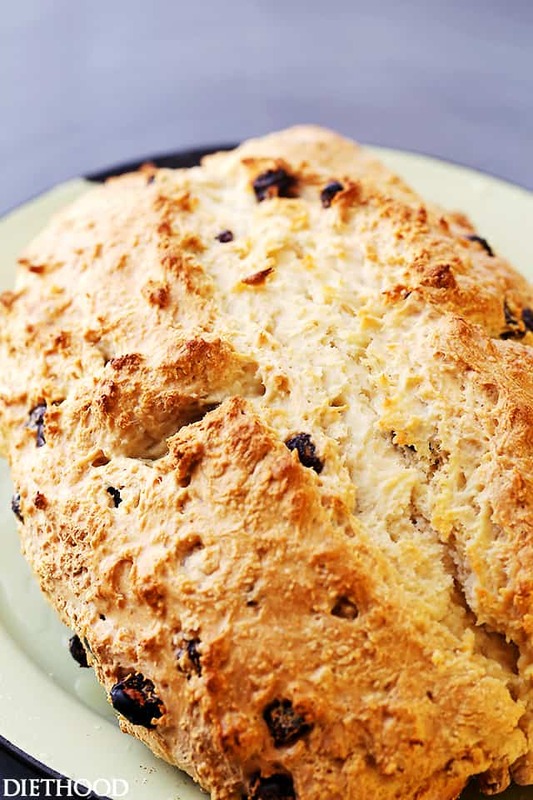 Besides the truth that it’s easy to make, and it’s the most cozy and comforting food known to humans, it is the most delicious hearty Irish dish that will warm your heart and your belleh. Honestly though? You would be wise to make this happen if you’re into the whole Irish and St. Patty’s thing. No. Scratch that. If you love damn good food, you should just go into the kitchen, walk in there right now, and make it. AND, you guys will want to eat it forever. An easy to make delicious and hearty traditional Irish winter stew with potatoes, sausages, and bacon. 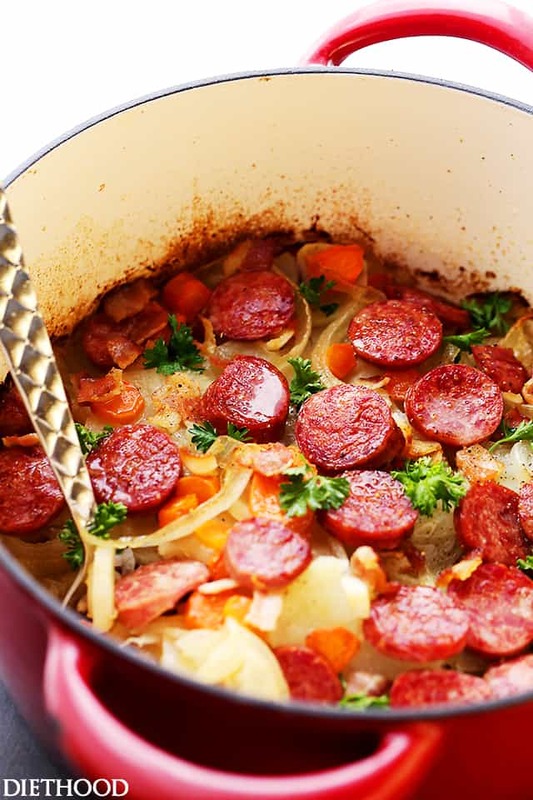 In a large saucepan, combine beef broth, sliced sausages, and bacon; bring to a boil. Lightly grease a dutch oven or casserole dish with cooking spray. 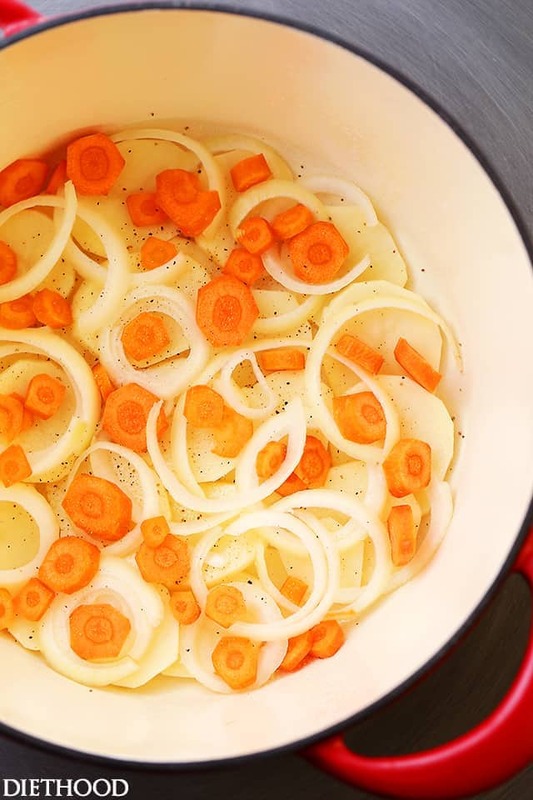 Arrange 1/3 of the onions and carrots over the potatoes, and season with a little salt and pepper. 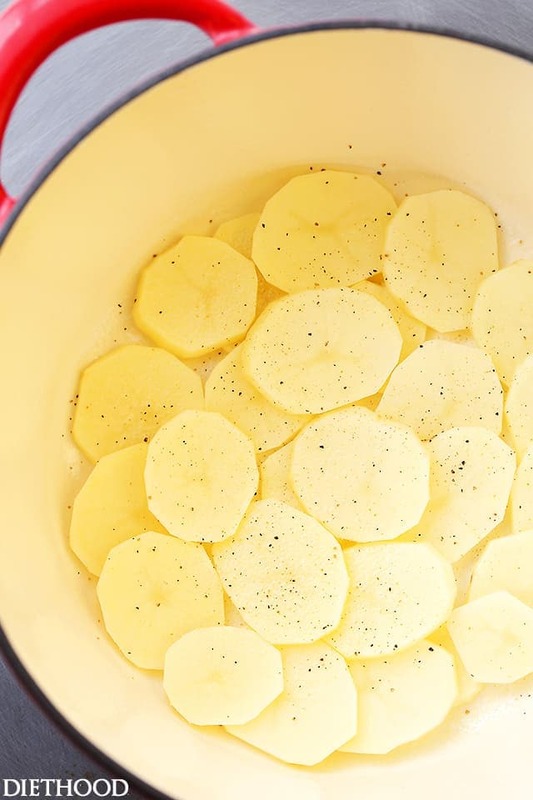 Continue to layer ingredients two more times, seasoning with salt and pepper as you go along. Remove cover and if mixture looks dry, add 1/2-cup water. Continue to bake for 15 minutes, or until lightly browned on top. 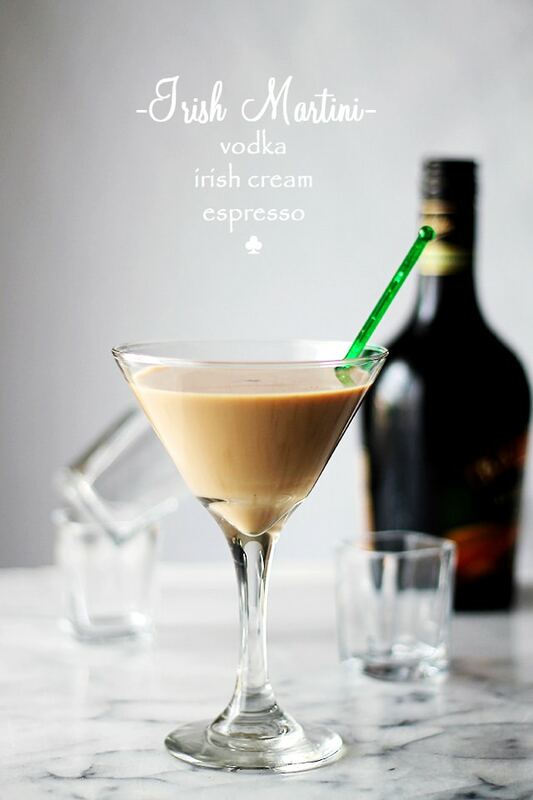 Make this for St Patrick’s Day (Eve). Everyone liked it, my grandson even had seconds. I made this last night. Wow delicious!! Absolute flavour riot. The only problem was the baking time. I baked it according to the recipe and ended up transferring it to my instantpot. If I had to guess I’d say 2 hrs in the oven. Totally doable but I ran out of time. Can you just cover your casserole dish with aluminum foil if you don’t have a lid? Tried this over the weekend. It is so delicious!!! 🙂 Definitely a keeper recipe. Thanks! I was so looking forward to making this then looked at the sodium level….I can only hope it tastes as good as it looked…. It really is good, but it’s those smoked sausages that contribute to most of the sodium. If you can, find ones that are reduced in sodium and that should help. I know Eckrich definitely makes them. What size casserole dish did you use?? I use a 6 quart dutch oven, but anything that’s around 3 quarts (like a 9×13 dish) will work. Don’t be so pretentious. Every family has their own coddle recipe. Perhaps you should open your mind and give this recipe a try. It is brilliant! Wanted to double chcck- you do not cook the bacon or sausage beforehand and do you recover the pot before cooking it the last 15 minutes? What kind of sausages do you use? 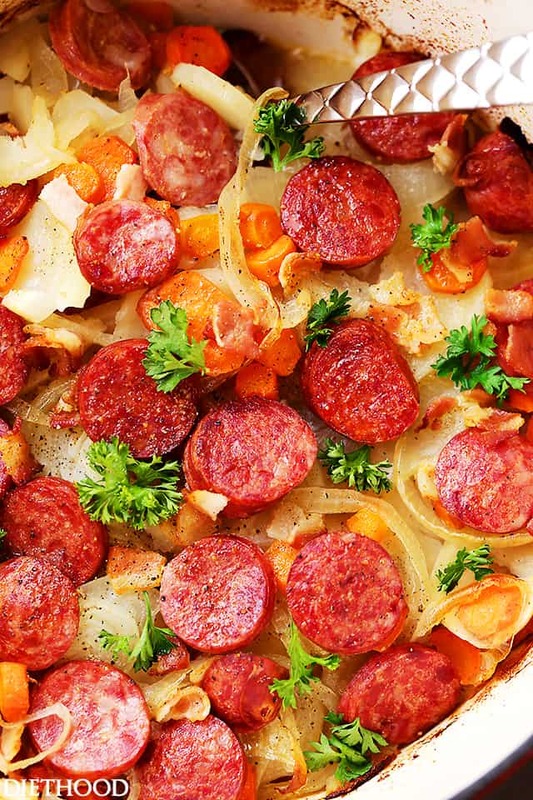 Kielbasa, breakfast, or something else? Hi Billy! Yes, Kielbasa, not breakfast sausages. Hi Tara! I have never tried making it in the crock pot, so I can’t say for sure. Wish I could help, but I really have no idea. 🙂 Thank you! Quick question, can this be made the night before?? Yes, definitely…..all the reading I have done has said that many times the Coddle was made and then allowed to cool (or go in fridge overnight, if you want for the next day) and eaten as a snack when everyone came home from the bar! 🙂 I bet the flavours would develop even more if you had it the next day, the way a stew or chili would….good luck! I made this recipe tonight for my husband and it was perfection!!! We both loved it. It is so tasty that no alterations or additional seasonings were needed at all! Wonderful and definitely going in my keeper list. Thanks so much for sharing! This looks so good–but does it really serve 1? I feel like I might be looking in the wrong place for serving sizes. I’ve never heard of Dublin Coddle before but it looks delicious! This is comfort food at it’s finest!! YUM! This looks like a great meal!! So comforting and flavorful! Can’t wait to try it. What a comforting and delicious dinner. I know my family would enjoy this! Ugh, the time change is killer! It always throws me off for a week or so, but the lighter evenings are great! And what a fun Irish meal! It looks incredible! 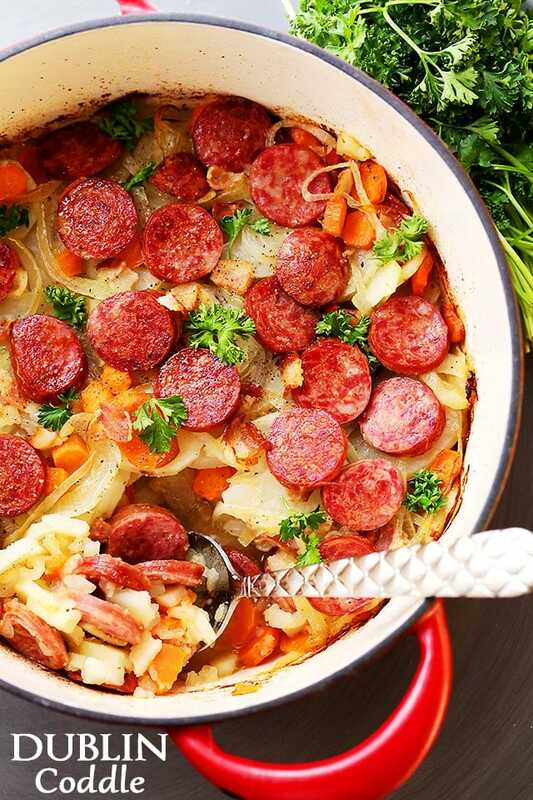 Now you have me completely confused (not that that is hard to do), was going to do an Irish stew as usual but this sounds so darn good and easy! Maybe I can make this next week with some ham left from Easter?? I can’t wait to try it! Now THIS is comfort food! YUM! Oh my goodness.. My husband would just love this! Maybe I’ll surprise him and make it for St. Paddy’s day! Well, St. Patrick’s almost here and that’s on my bucket list! Interesting way of preparing the bacon and sausages before using them in the casserole dish though I wonder if it were possible to reduce the fat by frying the bacon chunks separately before adding to the dish along with the broth/boiled sausages and discarding the bacon fat.